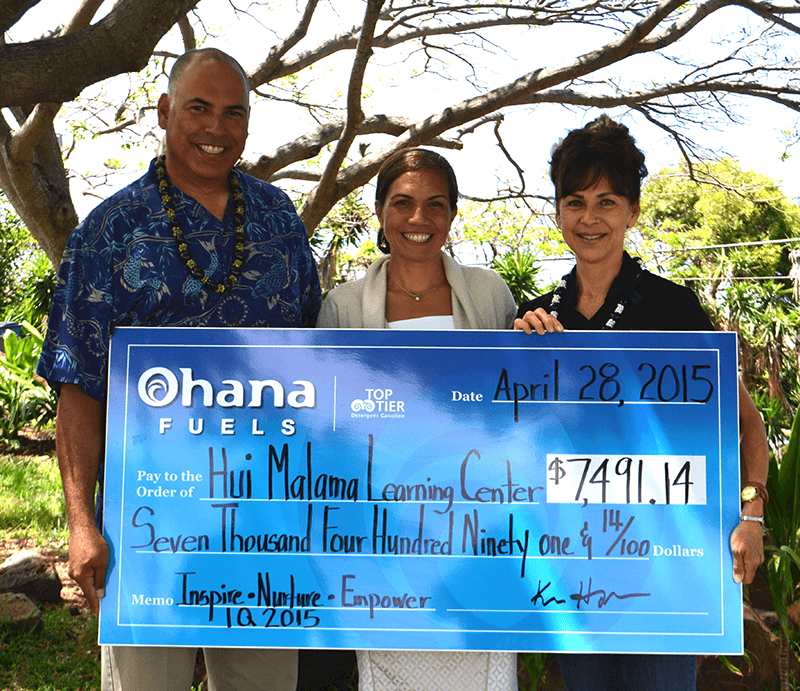 Ohana Fuels Supports Hui Malama Learning Center with a $7,491.14 present. WAILUKU, Hawaii, April 28, 2015 Students and staff of Hui Malama Learning Center were presented with a generous gift of $7,491.14 by Hawaii Petroleum through its Ohana Fuels “Fuel Up. Do Good” Community Giving Program. From January through March 2015, a portion of sales from Ohana Fuels TOP TIER™ fuel efficient gasoline, sold at eight of the Ohana Fuel Stations located throughout Maui, was designated for donation to Hui Malama Learning Center’s enrichment programs. In addition to the funds raised through the “Fuel Up. Do Good” Community Giving Program, Ohana Fuels also provided Hui Malama with the Minit Stop location and equipment to conduct carwash fundraisers, which helped raise additional funds. The funds donated by Ohana Fuels will allow the school to expand academic and mentoring programs as well as community service projects. “The mission of our Giving Program is to help meet the needs of the communities we serve by supporting non-profit organizations that improve the overall quality of life. Ohana Fuels proudly sponsors programs that enhance the vitality of our neighborhoods, celebrate our community’s success, and support local charities”, said Kimo Haynes, President of Hawaii Petroleum Inc. Hui Malama partnering with successful local businesses like Hawaii Petroleum is a critical component of the school’s new workforce preparedness project made possible through County and GIA funding. Hui Malama Learning Center was the fortunate recipient of the Ohana Fuel Up Do Good Donation for the first quarter of 2015. The funds donated by Ohana Fuels allowed the school to expand academic and mentoring programs as well as community service projects. Ohana Fuels, a TOP TIER™ brand of Hawaii Petroleum Inc. is on a mission. We pledge to provide ONGOING DONATIONS through our “Fuel Up. Do Good” community giving program to local groups and charities that impact the neighborhoods we serve. Ohana Fuels has eight SAFE, CLEAN, CONVENIENT locations across Maui and five on the Big Island. Ohana Fuels gasoline has been certified as TOP TIER™ to meet the premier standard of gasoline for optimum performance and fuel efficiency recognized by seven of the world’s top automakers, BMW, General Motors, Honda, Toyota, Volkswagen, Mercedes-Benz and Audi. TOP TIER™ additives help clean your engine; optimize fuel economy; eliminate hesitation, stalling, and rough idling; restore optimum performance; and reduce emissions. For more information visit OhanaFuels.com. Ohana Fuels Donates $8,214.38 to Maui Family Support Services, Inc.